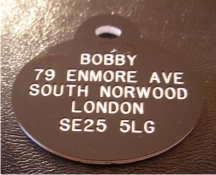 Message: Managed to fit on legal requirement of surname and address, also my home, mobile and vet's phone numbers - also the lettering "microchipped" and the microchipping database telephone number - all perfectly legible on the small tag - thank you for such a high quality product and excellent service. Have had the brass tags previously, lasted for years, really pleased with the quality. Gone for plastic this time so that it doesn't rattle! Message: At last a plastic dog tag that does not make white fur go black like metal tags do. GREAT!! Message: I love these pet tags. I have had them before and recommended them to my friends - who had 12 tags. Very good quality. The lettering stands out, they are light and wash well. Message: Excellent value. Very weather proof, don't fade and are strong.